This month we are going to finish looking at my room. In Sound Advice 4 & 5 we addressed my speaker placement and acoustic treatments. Now we are going to look at the final issue, the icing on the cake, equalization. Now, I know that word strikes fear and loathing into the heart of all audiophiles but hey, let’s get real. If you have a home theater you should know that almost every commercial movie theater in existence uses EQ (equalization). Every dubbing stage (film mixing studio) uses EQ. Any of the places doing high end film audio remixes for DVD release, like Mi Casa Multimedia (who works with New Line), uses EQ. In fact the Mi Casa guys are so tweaky about the sound in their rooms that I have a life long gig several times a year making sure the rooms stay in tune. So why, after all the trouble we went to, properly placing our speakers and treating the room, would we need EQ? Well, in case you haven’t read the newspaper lately, it’s not a perfect world (take a pill and read on). I certainly have set up rooms that did not require EQ after the physical work was finished. I do not believe in the indiscriminate use of EQ. I’m against adding more electronics into the listening chain unless it improves more issues than it creates. But most rooms that were not designed for audio from the ground up have some problem or another that is not treatable with acoustic fixes. These problems would include scenarios such as my room has; open walkways, non symmetrical walls, non symmetrical furniture placement etc. Then there is the problem of dealing with bass in a fashion acceptable in most living spaces. Treating bass problems requires more space than most home owners are willing to sacrifice and there is the nagging issue of the esthetics of a bass trap (basically none). A good minimum phase parametric equalizer can solve low frequency problems cost effectively and with no esthetic intrusion in a room. Many subwoofer manufacturers have recognized the above facts and are now building EQ into their products. Even high end companies like Meridian are putting EQ into their preamps. So the arguments against using EQ seem to be fading away. There are two styles of equalizers currently utilized for room tuning. These are third octave (fixed frequency centers and bandwidth) and parametric (adjustable frequency centers and bandwidth). I maintain strong opinions on this subject backed up by science and listening. I recommend minimum phase parametrics over third octave equalizers? Room problems are not well behaved phenomenon that follow fixed patterns. A parametric equalizer allows you to dial in the exact center frequency to address the problem. Then it allows you to shape the curve (bandwidth) to give a proper fit solution. Third octave is simply hit or miss on the center frequencies and brute force with its fixed bandwidth. We wind up equalizing more than necessary or often can't get to the problem at all with third octave equalizers. Parametric solutions just make sense. Figures 1 & 2 demonstrate the point. 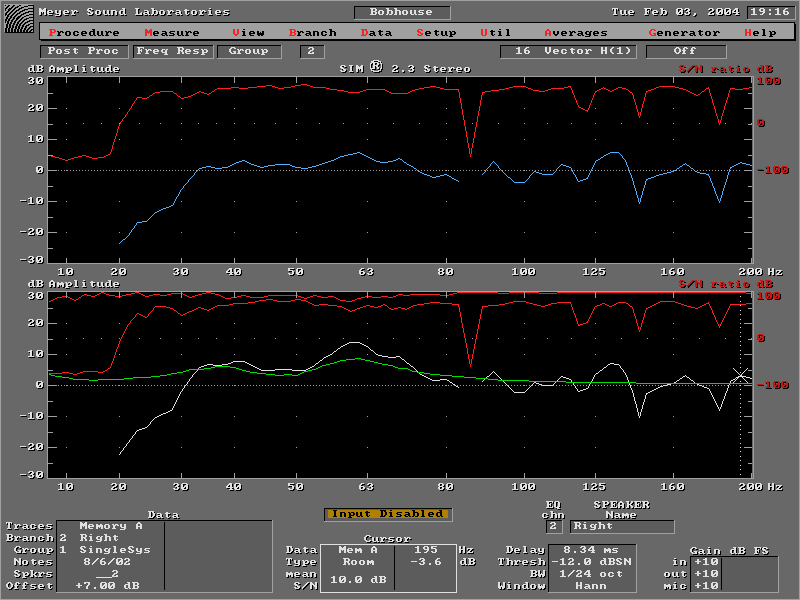 (Note that the green equalizer curve displayed is the inverse of the equalization that is being applied. This simply makes it easy to see how it fits into the room curve) Figure 1 shows the low end of a room curve with a third octave solution applied to it. Notice that you can't quite get to the problem and wind up affecting more frequencies than necessary, especially around 150Hz. Figure 2 is the same room with a parametric solution. The parametric exhibits a much better match. In the past it was difficult to design parametrics that did not introduce extraordinary phase shift, but today many designers have this situation solved. Some room equalizers of modern design even utilize minimum phase filters. Minimum phase frequency response anomalies occur when speakers are placed in proximity to boundaries such as walls, ceilings or soffits. Minimum phase filters allow for more latitude to boost or cut without hearing that excess phase shift. It is also proven that they can restore the impulse response of a speaker affected by minimum phase problems. Equalizable room/speaker interaction is a minimum phase, second order phenomenon exhibiting constant bandwidth and linear frequency spacing. At best, third octave equalizers are constant percentage bandwidth with logarithmic frequency spacing. Figure 3 demonstrates the type of frequency response comb filtering caused by a 1 millisecond echo. In practical terms this is typical of a reflection from a coffee table sitting in front of the couch. Note that the combing is not logarithmically spaced (e.g. third octave) but rather a constant bandwidth of 1kHz. The frequency centers of the comb are an octave wide from 1kHz-2kHz and 1/10 octave wide from 10kHz-20kHz, meaning that a device with fixed third octave bandwidth cannot create a complement. They also fall on frequencies that often do not match the fixed ISO standard frequency selections of a third octave equalizer. Once again parametrics give you the versatility to address the problem as it exists. Parametrics also allow you to utilize a single filter to address an overall trend in the response while with third octave, several filters must interact to address this same issue. I am not advocating equalizing the coffee table reflection, this is simply a practical demonstration of the problem. Part of the blame of using third octave equalizers for so long must be placed on the fact that the industry primarily used third octave analyzers. This made it a simple match up for tuning and is quite understandable. But third octave analysis does not offer enough resolution to actually see the whole story. There are now a number of affordable analyzers on the market that have much higher resolution. My SIM System crunches the numbers at 1/48th octave resolution. Look at figures 4 and 5. Figure 4 is a third octave mid band shot of a room. Notice that there appears to be a hole from about 500-800Hz (highlighted area). This would lead one to believe that some boost centered at 630Hz on your third octave equalizer would fix the problem. In actuality, viewing the 1/24th octave resolution of figure 5, we see that this is not a wide band hole but a series of tight combs that should probably not be equalized. The third octave analyzer averaged this section out in a broad stroke. This simplified but accurate picture is the rule rather than the exception. I strongly suggest that you look at your rooms with effective resolution if you want to correctly solve the problems. While many people understand the need to "tune up", there is quite a bit of confusion about maintaining the system tuning. There are several factors that contribute to why a system needs to be checked periodically to stay in tune. Some acoustic factors are relatively easy to understand. If wall treatments or furniture have been added then you have changed the linearity of the system response as well as the room's reverb structure. The same would apply to construction such as adding an equipment rack or anything that changes wall angles, room volume or mass. Changing electronic components can also make a big difference in linearity. New amplifiers may handle your speaker impedance or wire capacitance differently and cause changes in linearity. I have witnessed changes of several dB in different parts of the frequency spectrum when clients switched between solid state and tube amps. Of course changing crossovers applies as well. Filter order and the crossover point itself will have an effect on the system. Of course with any of these changes, attention must be paid to overall system polarity. Any time you change a speaker component you should check the system response. I have seen fluctuation by as much as 3dB across the range of a speaker when an old element was replaced with a new one. Sensitivity will vary and many manufacturers do not have a tight grip on quality control in this department. The above examples are fairly clear cut as they are actual physical changes that are easy to identify. Now we enter into a gray area. The most asked question I hear is "How often should I adjust the EQ in my system?" It is a physical fact of life that as speakers age, their resonant frequencies change from fatigue. These resonances need to be adjusted over time as the tuning will "drift" out. How long that takes depends on how often and loud a system is driven. Moderately driven system can often go years before changes in linearity occur. Some clients who listen often at loud volumes may need attention after six months. So getting away from all the tech talk, how did my room finally turn out? Figure 6 shows my little EQ rack. 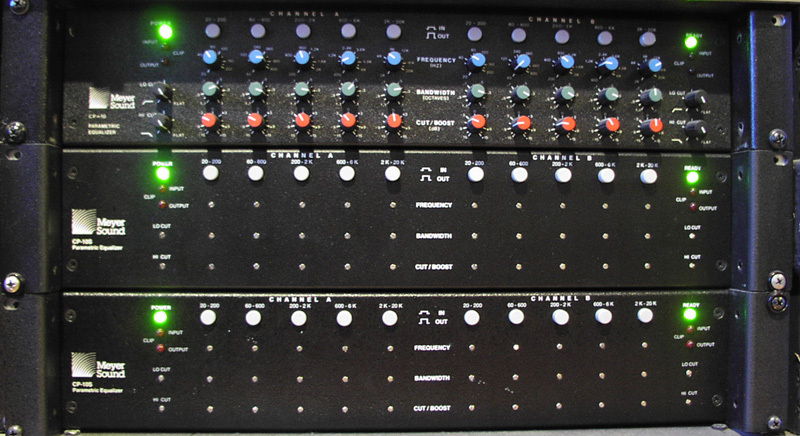 I am using 5 channels of the Meyer CP-10 & 10S EQs for the Meyer HD-1 speakers on L/C/R/LS/RS. I use the EQ built into the Revel B-15s for the LFE channel. Figure 7 shows the correction I applied to my Right speaker. This is fairly typical of the correction performed in my room. After equalization I heard several significant improvements. The bass was much tighter and better defined. The frequency spectrum was more linear, which equates to no musical notes missing or outstanding; the musical spectrum was smoothly connected from top to bottom. Imaging improved as well because now the speaker frequency responses were extremely well matched. Not only was it easier to pick out individual instruments in the soundstage, but the center image was rock solid as well. No more voice that sounds three feet wide. Between the use of parametric equalizers and high resolution analysis systems, there exist good solutions to address room/speaker interface correction. These solutions can significantly upgrade the quality of the listening environment, leading to a more satisfying and involving listening experience. Fig. 1. Third octave EQ attempt to correct low end problem (inverse of EQ shown). White trace is room response; green trace in EQ inverted to show room fit; red trace is coherence. Fig. 2. Parametric EQ correction of low end problem (inverse of EQ shown). White trace is room response; green trace in EQ inverted to show room fit; red trace is coherence. Fig. 3. Effects of 1 ms delay on signal. Fig. 7. The top trace shows the equalized speakers with 1/24th octave resolution (blue). The bottom trace shows the unequalized room response (white) with inverse EQ overlay (green).